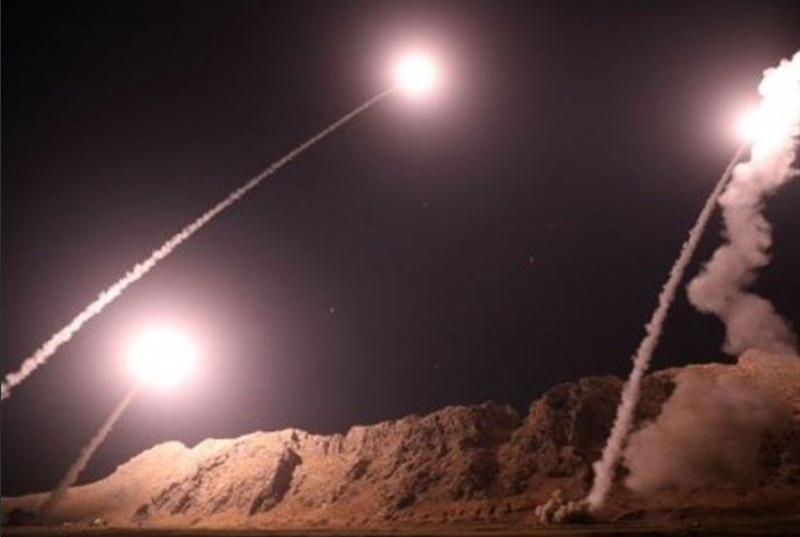 Iran fired several ballistic missiles at suspected terrorist sites in Syria in response to the terrorist attacks on its military parade on in southwestern Iran (in the city of Ahvaz) which killed 24. The Revolutionary Guard, the military group safeguarding the Ayatollahs regime, said in a statement: "the headquarters of those responsible for the terrorist crime in Ahvaz was attacked a few minutes ago east of the Euphrates by several ballistic missiles fired by the aerospace branch of the Revolutionary Guard." The missiles used flew 354 miles and crossed Iraq to get to their targets. Iran claimed that they had been able to kill many "takfiri terrorists," a term often used by Iranian officials to describe Sunni Muslim extremists. The state’s Fars news agency said the missiles had hit the Syrian border town of Albu Kamal to the west of the Euphrates River (in the eastern Syrian province of Deir Ezzor). Although Syrian President Assad says he has recovered the area, this town is still held by militiamen who recaptured it from the Sunni extremist group "Islamic State" (ISIS). Iran’s President Khamenei stated: "This cowardly act was the work of those very individuals who are rescued by the Americans whenever they are in trouble in Iraq and Syria and who are funded by the Saudis and the (United) Arab Emirates,"
Both Saudi Arabia and the UAE say they had nothing to do with the Ahvaz attack whilst the US ambassador to the UN, Ms Nikki Haley responded to the accusations by stating that the Iranian regime should ‘look in the mirror’ before accusing anyone of terrorism. Related coverage: <a href=" http://thegoldwater.com/news/37714-Iran-Blames-US-For-Military-Parade-Attack-That-Killed-24-Video"> Iran Blames US For Military Parade Attack That Killed 24 (Video)</a>. Thanks to Bush and Obummer we are the a$$hats that started this $hit. Iran needs an interal uprising big enough to knock the terror cult that runs Iran off balance, then we can aid to help stabilize the $hit hole. Better yet the Izzys should stabilize the mess! Nothin’ some good ol’ ‘Merican nukes can’t put the kabosh on. Zap’em good, then the shmiddle east will lay down for a good 100 years as we chill out and listen to some Zeppelin. "Whitey" uses Yiddish terms while arguing for Americans to continue blood libel for Israel. How surprising. Gold star for effort, Rebbe. Let all Middle Eastern countries nuke each other. They'll be no loss. Then send out all the fakeugees to repopulate, along with the leftard traitors from every country invaded. Maybe then the world can start to get back to some shred of sanity. But FIRST let's make sure that Trump continues his commitment to Making Israel Great Again. As Sheldon Adelson pointed out Trump is the MOST Israel friendly president ever. I love the fact that he's offering a larger payout to Israel than any other president in history. So what we're one of the richest nations in the world, the goyim should know their place by now and continue to serve (with their tax dollars and the blood of their sons) for perpetuity.